Looks great, and works well. Cooks fast too. Certain models have had issues with reliability. The Sanyo EM-G3597V features a unique hidden control system, in which a large selection of the controls are situated behind the door panel, thus remaining hidden during use. It's overall 23 litre capacity makes it a relatively small grill microwave, and it features 6 different power levels and 8 different auto cook menus. Power output is 900w when in microwave mode, and 1000w when using the grill. The Sanyo timer system goes up to a maximum of 99 minutes, complete with a handy delay starting system. The exterior is very minimalist, and looks smart - the bulk of the controls being hidden contribute to this design. Onto the bad points - unfortunately users of this model seem to be divided - if this silver microwave oven works then it performs really well. Our test model worked fine, and we experienced no issues at all. 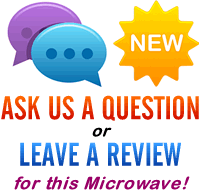 However we've heard of several users who this microwave proved to be unreliable, and had to be returned. Essentially this model seems to be a little unreliable at times - if you can get a refurbished model then it will be worth considering, as refurbished models are often subjected to better and more thorough testing than new models, and thus is less likely to have any issues. 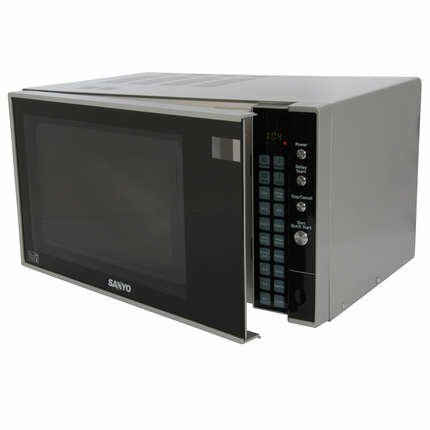 The Sanyo EM-G3597V is a well designed microwave - the hidden control system looks neat. We have heard of certain models proving to be unreliable - bear this in mind.